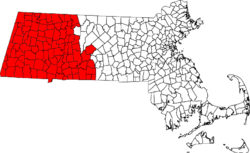 Area code 413 (created in 1947) is the area code for the western third of Massachusetts. It is the largest area code by land area covered in the Commonwealth, and extends from the New York state line eastward into Worcester County (only the towns of Hardwick and Warren), while excluding the Franklin County towns of Orange, New Salem, Warwick, and Wendell, which use the overlay of area codes 978 and 351. The most-populous city in the 413 area code is Springfield. 413 also includes Chicopee, Northampton, Holyoke, Greenfield, and Amherst (LATA code 126). Massachusetts was scheduled to receive two area codes under the original North American Numbering Plan proposal - the only state in New England to be split between two area codes. Area code 413 was intended for use in Pennsylvania [permanent dead link]. However, when area codes were finally assigned, the eastern two-thirds of the state (including Boston and Worcester) was assigned 617, with 413 in the west. Due to the low population density of western Massachusetts, 413 remained in its original configuration even as the eastern portion of the state gained an additional three area codes from 1988 to 1997. As a result, 413 is the only original area code in Massachusetts that still maintains its original boundaries, and is one of the few original area codes (not counting those that cover an entire state) that has never been split or overlaid. Under current projections, it will stay that way for the foreseeable future. Despite the proliferation of cell phones and pagers (particularly in and around Springfield), 413 is nowhere near exhaustion.